Doubles Knockout winners - William Atkinson & M Bollands. Doubles runners up - Paul Kilpatrick & Jimmy Middlemas. 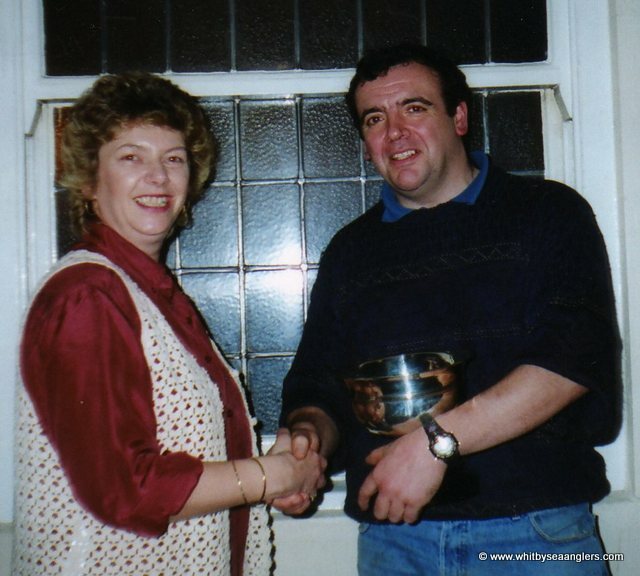 Heaviest Fish in a competition - Brian Harland - 12 lb 10 oz (17th March 1996). Heaviest Fish out of competition - Ian Russell - 11 lb 07 oz. Christmas Match winner - Les Spedding - 3 lb 08 oz. Greatest number of fish - Neil Inglis - 79 fish. Heaviest Bag of fish in a competition - William Atkinson - 20 lb 12 oz. Open Five Competition winner - Ian Russell. 1st - Chris Evans - 9 lb 04 oz. 2nd - Adrian Kelly - 8 lb 02 oz. Total weight for the season - 1,440 lb 01 oz. Total number of fish - 771. 27th September 1995 - Ian Russell Heaviest Fish - 6 lb 05 oz part of a 14 lb 08 oz bag of 7 fish. 1st October 1995 - Brian Harland Heaviest Fish - 5 lb 10 oz. 25th October 1995 - George Middlemas Heaviest Fish - 6 lb 09 oz, part of an 11 lb 08 oz bag of 2 fish. 1st November 1995 - Ian Russell Heaviest Fish - 7 lb 09 oz. 4th November 1995 - Brian Harland Heaviest Fish out of competition - 8 lb 08 oz. 8th November 1995 - Paul Short Heaviest Fish - 8 lb 06 oz. 3rd December 1995 - Adrian Nelson Heaviest Fish - 6 lb 10 oz, part of a 10 lb 03 oz bag of 3 fish. 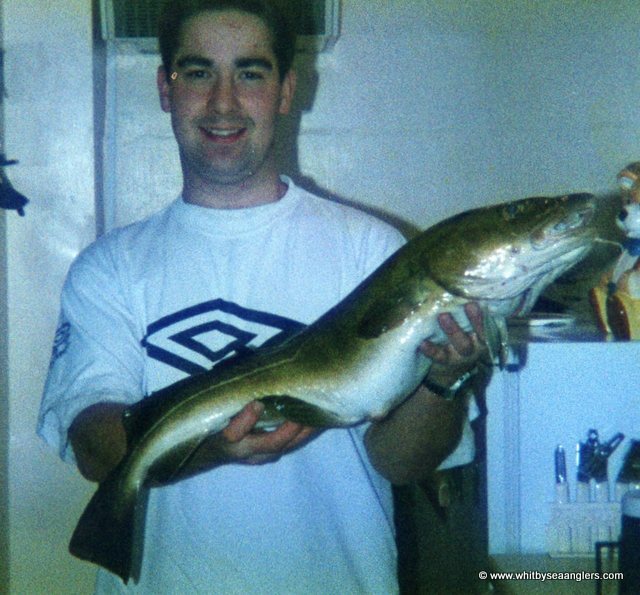 13th December 1995 - Neil Inglis Heaviest Fish - 9 lb 10 oz. 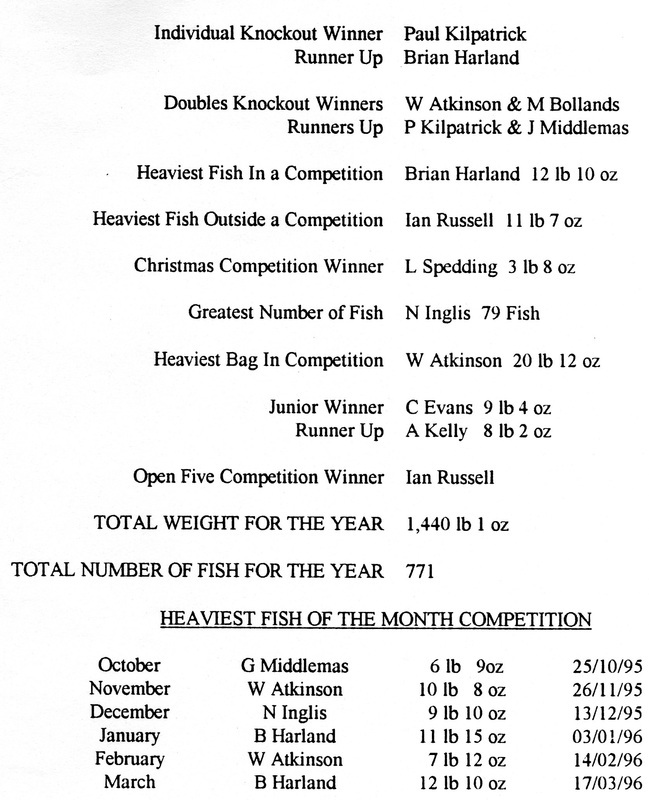 28th December 1995 - Ian Russell Heaviest Fish out of competition - 11 lb 07 oz. 3rd January 1996 - Brian Harland Heaviest Fish - 11 lb 15 oz. 24th January 1996 - Denis Thompson Heaviest Fish - 8 lb 12 oz, part of a 10 lb 07 oz bag of 2 fish. 14th February 1996 - William Atkinson Heaviest Fish - 7 lb 12 oz, part of a 10 lb 02 oz bag of 2 fish. 17th March 1996 - Brian Harland Heaviest Fish - 12 lb 10 oz, part of a 15 lb 08 oz bag of 2 fish. 26 members entered and 19 weighed in. William Atkinson Heaviest Fish - 10 lb 08 1/2 oz, part of a 20 lb 02 bag of 2 fish. 20 lb 12/16oz - 5 fish. 16 lb 12/16oz - 5 fish. 14 lb 6/16oz - 4 fish. 11 lb 4/16oz - 3 fish. 10 lb 2/16oz - 3 fish. 10 lb 00 oz - 4 fish. 8 lb 9/16oz - 5 fish. 7 lb 11/16oz - 2 fish. 6 lb 7/16oz - 2 fish. 6 lb 4/16oz - 3 fish. 5 lb 7/16oz - 3 fish. 4 lb 5/16oz - 1 fish. 2 lb 12/16oz - 1 fish. 2 lb 6/16oz - 2 fish. 1 lb 15/16oz - 1 fish. 1 lb 8/16oz - 1 fish. 1 lb 2/16oz - 1 fish. Total WSAA weigh in 144 lb 00 oz. 10 members entered and 2 weighed in. 25 members entered and 8 weighed in. WSAA member Adrian Nelson won the event, with 1 codling of 6 lb 09 oz, but was not entered into WSAA club sweep. As reported to the Whitby Gazette by Bernard Vasey. There are no reports for Wednesday 27th Sept 1995 to Wednesday 22nd November 1995. The event attracted 189 anglers from as far as Cleveland and Scarborough, as well as local anglers in the Whitby area. Our first prize of £250 went to Scarborough angler Steve Ianson with the heaviest bag of codling 25 lb 06 oz - 5 fish. 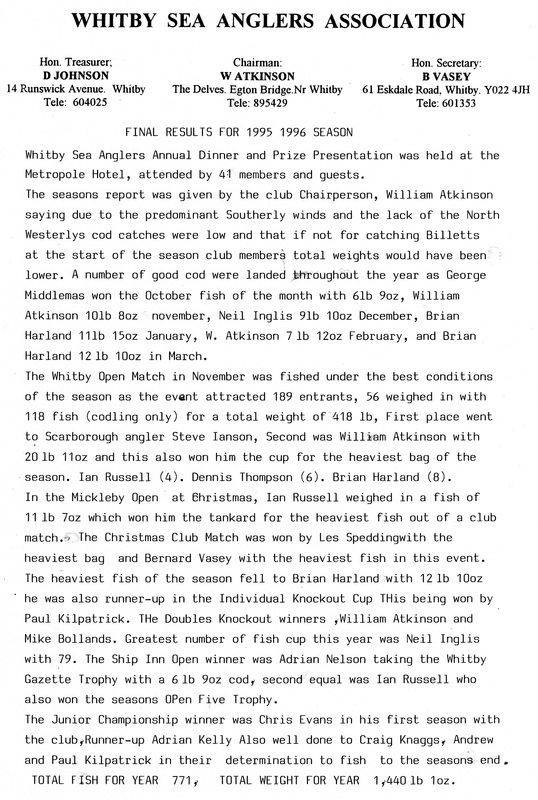 2nd £100 to Whitby angler William Atkinson 20 lb 11 oz - ? fish. 3rd £50 to Scarborough angler P Hardy 17 lb 15 oz - ? fish. The sweep for the 1st Heaviest Fish went to P. Hardy 12 lb 03 oz. 2nd Heaviest Fish went to Steve Ianson 12 lb 01 1/2 oz. Despite the wet conditions after 6 hours and a good south easterly swell 56 anglers weighed in with 118 fish (codling only) for a total weight of 418 lb. 17 anglers had double figure bags and 44 anglers received prizes. 25 lb 06 oz - 5 fish. 2nd heaviest Fish - 12 lb 01 1/2 oz. 12 lb 03 oz - 1st Heaviest Fish - 12 lb 03 oz. The south easterly sea was still running and a flooding tide with 20 anglers fishing, catches were low, only 22 fish weighed in. 1st - Paul Kilpatrick - 13 lb 00 oz - 5 fish. 2nd - Dave Perrett - 9 lb 15 oz - 2 fish. 3rd - Denis Thompson - 9 lb 12 oz - 2 fish. 4th - Andrew Craig - 6 lb 10 oz - 3 fish. 5th - Neil Inglis - 6 lb 01 oz - 2 fish. 6th - James Gilpin - 4 lb 02 oz - 1 fish. 7th - Brian Harland - 3 lb 14 oz - 2 fish. 8th = Bernard Vasey - 2 lb 01 oz - 1 fish. 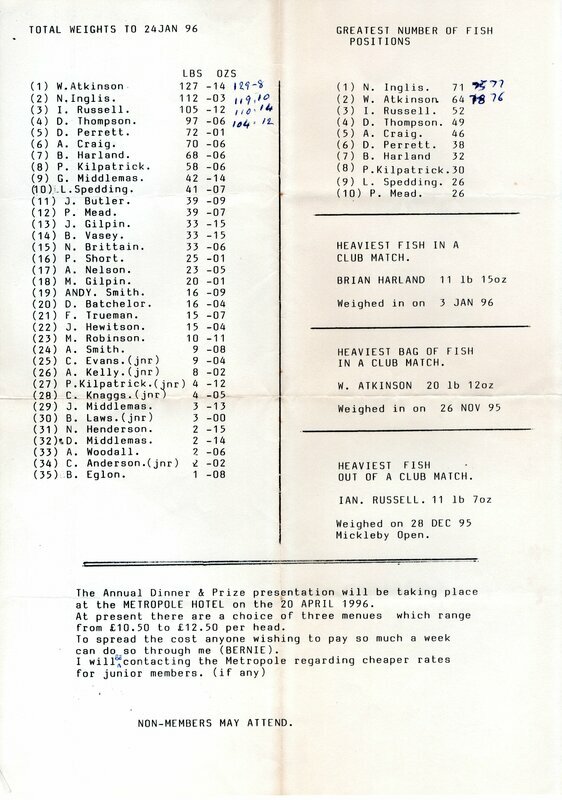 8th = Norman Brittain - 2 lb 01 oz - 1 fish. 10th - Ben Laws (Jnr) - 1 lb 15 oz - 2 fish. 11th - Les Spedding - 0 lb 15 oz - 1 fish. A very wet night and a growing south south easterly sea gave Adrian Nelson first place with his heaviest fish of 6 lb 10 oz and a bag of 10 lb 03 oz, this season. 1st - Adrian Nelson - 10 lb 03 oz - 3 fish, one of 6 lb 10 oz. 2nd - Neil Inglis - 5 lb 05 oz - 3 fish. 3rd - Bernard Vasey - 4 lb 05 oz - 2 fish. 4th - Denis Thompson - 3 lb 14 oz - 4 fish. 5th - Andrew Craig - 3 lb 02 oz - 2 fish. 6th - Dave Perrett - 3 lb 00 oz - 2 fish. 7th - James Gilpin - 2 lb 15 oz - 1 fish. 8th - Norman Brittain - 2 lb 05 oz - 2 fish. 9th - Mark Robinson - 1 lb 14 oz - 1 fish. 10th - M Gilpin - 1 lb 13 oz - 1 fish. 11th - John Butler - 1 lb 12 oz - 1 fish. 12th - Brian Harland - 1 lb 10 oz - 1 fish. 13th - William Atkinson - 0 lb 10 oz - 1 fish. On both last Wednesday and Sunday Robin Hoods bay produced the fish with a cocktail of worm, mussel and peeler crab. The White Hart Open, Mickleby, 28th December 1995. The night match was fished under the worst conditions this season, snow showers and a strong wind from the north east kept catches low. The sea was surging under an ebbing tide with loose weed in the runs which kept the larger fish in deeper water. Six anglers returned with fish. 1st - Denis Thompson - 5 lb 10 oz - 3 fish. 2nd - Paul Kilpatrick - 5 lb 08 oz - 3 fish. 3rd - John Butler - 4 lb 04 oz - 2 fish. 4th - Ian Russell - 3 lb 06 oz - 2 fish. 5th - Neil Inglis - 2 lb 09 oz - 1 fish. 6th - Andy Smith - 1 lb 01 oz - 1 fish. 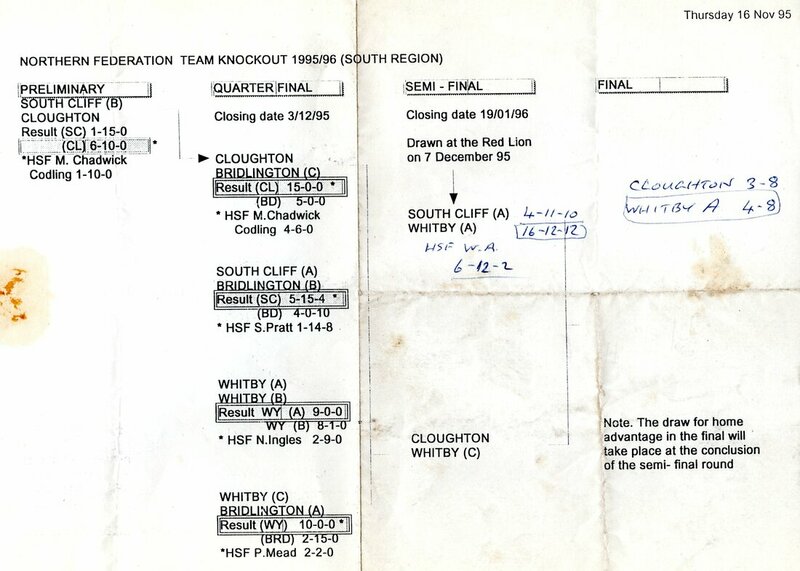 This was also a Federation Knockout Match between Whitby A and Whitby B teams and Whitby A went through 9 lb 00 oz and 8 lb 01 oz. 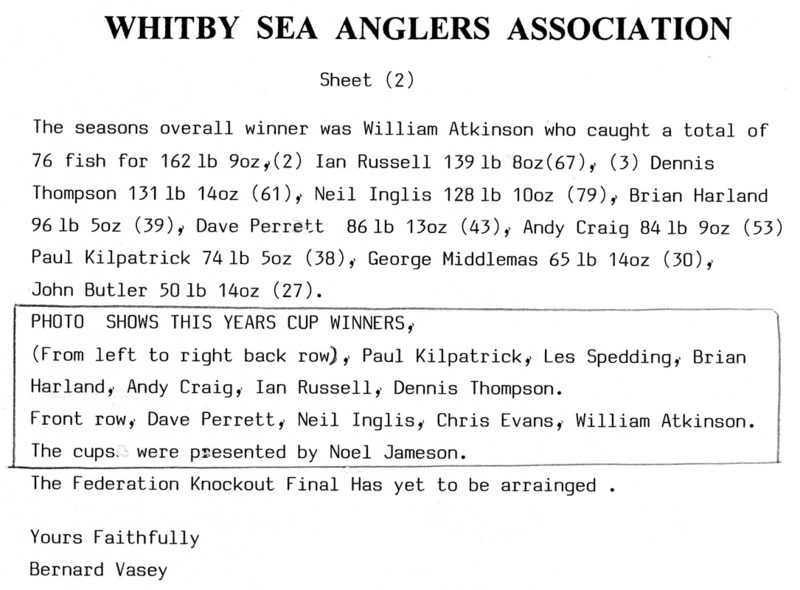 Whitby Sea Anglers entered the Cloughton Open, sponsored by Autoscan Arundale Nissan of Scarborough. This was a day match fishing 10am to 4pm and weigh in by 5pm at the Red Lion, Cloughton, where a hot meal was provided after the prize presentation which was made by Councillor TW miller. With the wind coming round to the south west and bright sunlight, the sea conditions were flat with clear water. Catches of codling were rare, with only 5 anglers out of 125 competitors who fished, weighing in a total of 6 fish. 2nd = Dave Perrett - 1 lb 14 7/8oz. - received £75. 2nd = Steve Ianson - 1 lb 14 7/8oz - received £75. 4th - Mick Hillaby - 1 lb 12 7/8oz. 5th - Steve Ianson - 1 lb 12 ¾ oz. 6th - Neil Inglis - 1 lb 11 ¼ oz. 10am to 3pm, weigh in till 4pm at White Hart Inn. This is a Heaviest Bag Match, tickets £3.50. Neil Inglis started fishing by catching an under sized codling, (which he returned) then moving near the end of the match to the sea wall at Robin Hoods Bay, next to fellow club members and land the clubs heaviest fish this season of 9 lb 10 oz. 1st - Neil Inglis - 9 lb 10 oz - 1 fish. 2nd - Andy Smith - 6 lb 02 oz - 1 fish, his heaviest this season from Sandsend. 3rd - William Atkinson - 6 lb 02 oz - 3 fish. 4th - Paul Kilpatrick - 4 lb 02 oz - 2 fish. 5th - Norman Brittain - 3 lb 09 oz - 1 fish. 6th - Andrew Craig - 3 lb 04 oz - 1 fish. 7th - Denis Thompson - 2 lb 13 oz - 2 fish. 8th - Dave Perrett - 1 lb 03 oz - 1 fish. Neil Inglis, WSAA, Wednesday 13th December 1995. 9 lb 10 oz. This was the Christmas Match Competition for club members only, fishing times 2pm to 7pm. The conditions were far from perfect, even with an easterly swell the water was very clear. Catches were made when darkness fell with only 8 anglers weighing in a total of 12 fish as 29 fished. The heaviest fish went to Bernard Vasey 2 lb 04 oz. 1st - Les Spedding - 3 lb 08 oz - 2 fish - heaviest bag of fish. 2nd = Denis Thompson - 3 lb 06 oz - 3 fish. 2nd = Ian Russell - 3 lb 06 oz - 2 fish. 4th - Bernard Vasey - 2 lb 04 oz - fish - heaviest fish . 5th - Andrew Craig - 1 lb 15 oz - 1 fish. 6th - Dave Batchelor - 1 lb 09 oz - 1 fish. 7th - Paul Kilpatrick - 1 lb 03 oz - 1 fish. 8th - Adrian Nelson - 0 lb 09 oz - fish. Members would like to thank Robbie and Dave for the excellent Christmas meal which was enjoyed by all at the Pier Inn. 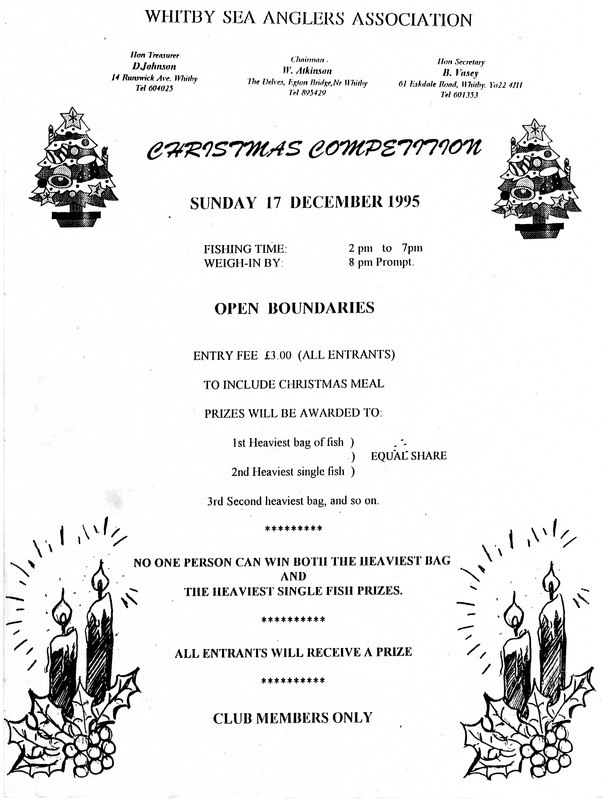 Ship Inn Open, 14th January 1996 - Incorporating the Whitby Gazette Trophy. 1st - D Batchelor - 8 lb 00 oz - 3 fish. 2nd - Ian Russell - 7 lb 00 oz - 6 fish. 3rd - Phil Mead - 6 lb 00 oz - 3 fish. 4th - Denis Thompson - 5 lb 03 oz - 1 fish. 5th - Neil Inglis - 4 lb 12 oz - 3 fish. 6th - George Middlemas - 4 lb 00 oz - 2 fish. 7th - Andy Smith - 2 lb 03 oz - 2 fish. 8th - Dave Perrett - 2 lb 00 oz - 1 fish. 9th - Les Spedding - 1 lb 15 oz - 1 fish. 10th - Paul Kilpatrick - 1 lb 12 oz - 1 fish. 11th - Brian Harland - 1 lb 10 oz - 2 fish. Whitby Sea Anglers returned to club fishing after the Christmas new year break to good conditions from a south easterly sea which produced fish for 15 out of the 18 members who fished. The best bag came from William Atkinson - 18 lb 05 oz - fish, including one of 9 lb 00 oz. This bag of fish took him over the 100 lb barrier for the season to date. 1st - William Atkinson - 18 lb 05 oz - 4 fish, including one of 9 lb 00 oz. 2nd - Ian Russell - 13 lb 05 oz - 3 fish. 3rd - Brian Harland - 11 lb 15 oz - 1 fish (now heaviest fish in a club match). 4th - Bernard Vasey - 9 lb 13 oz - 4 fish. 5th - Dave Perrett - 9 lb 08 oz - 3 fish. 6th - George Middlemas - 6 lb 05 oz - 3 fish. 7th - James Gilpin - 5 lb 06 oz - 1 fish. 8th - Denis Thompson - 4 lb 07 oz - 2 fish. 9th - Norman Brittain - 4 lb 01 oz - 2 fish. 10th - Phil Mead - 3 lb 12 oz - 2 fish. 11th - Mark Robinson - 2 lb 06 oz - 1 fish. 12th - Neil Inglis - 2 lb 02 oz - 1 fish. 13th - Paul Short - 1 lb 13 oz - 1 fish. 14th = John Butler - 1 lb 08 oz - 1 fish. 14th = Andy Smith - 1 lb 08 oz - 1 fish. Total weigh in 96 lb 04 oz. With the rough south easterly sea conditions continuing it did not produce the fish until the tide ebbed, leaving loose weed high on the scars. Catching his first near the end of the match Neil Inglis had the top bag for 12 lb 02 oz, one fish was 7 lb. 1st - Neil Inglis - 12 lb 02 oz - 3 fish. 2nd - William Atkinson - 9 lb 00 oz - 5 fish. 3rd - Ian Russell - 7 lb 08 oz - 2 fish. 4th - Andrew Craig - 5 lb 15 oz - 1 fish. 5th - Paul Kilpatrick - 5 lb 02 oz - 2 fish. 6th - Chris Evans (jnr) - 2 lb 06 oz - 1 fish. 7th - Bernard Vasey - 1 lb 13 oz - 1 fish. 9th - Denis Thompson - 1 lb 11 oz - 1 fish. Ian Russell now has the Heaviest Fish out-side a club night with a fish from the Mickleby Open weighing 11 lb 07 oz. Andrew Craig and Brian Harland. Denis Thompson and Paul Kilpatrick. Ship Inn Open 14th January 1996. This club match incorporated the singles semi-finals knockout where Brian Harland and Paul Kilpatrick go through to the final. 1st - William Atkinson - 9 lb 05 oz - 4 fish. 2nd - Phil Mead - 2 lb 13 oz - 3 fish. 3rd - Paul Kilpatrick - 2 lb 09 oz - 1 fish. 4th - Adrian Nelson - 2 lb 06 oz - 1 fish. 5th - John Butler - 2 lb 05 oz - 1 fish. 6th - George Middlemas - 2 lb 02 oz - 1 fish. 7th - Brian Harland - 1 lb 11 oz - 1 fish. 8th - Neil Inglis - 1 lb 07 oz - 1 fish. 9th - Andrew Craig - 1 lb 01 oz - 1 fish. 10th - Norman Brittain - 0 lb 11 oz - 1 fish. Fishing in the Federation Knockouts semi-final Whitby A Team consisting of William Atkinson, Ian Russell, Denis Thompson and Dave Perrett beat South Cliff A Team 16 lb 12 oz to 4 lb 11 oz, taking them into the final. 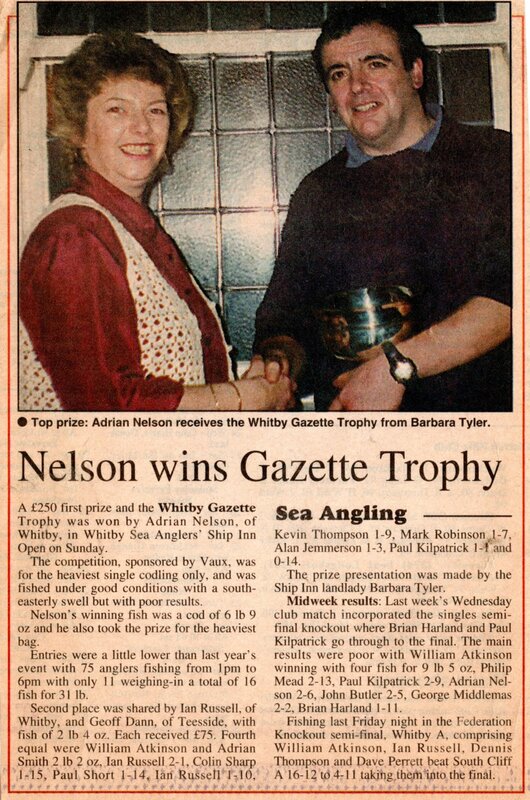 Adrian Nelson is presented with the Whitby Gazette Trophy by Barbara Tyler, landlady of the Ship Inn. Photograph by Bernard Vasey. Fishing a low water flood match and a calm sea 18 anglers found it hard to find fish even with colour in the water. 1st - Neil Inglis - 4 lb 02 oz - 3 fish. 2nd - Paul Kilpatrick - 3 lb 11 oz - 2 fish. 3rd - Denis Thompson - 2 lb 02 oz - 1 fish. 4th - Jimmy Middlemas - 1 lb 12 oz - 1 fish. 5th - Mark Robinson - 1 lb 04 oz - 1 fish. 6th - William Atkinson - 0 lb 14 oz - 1 fish. 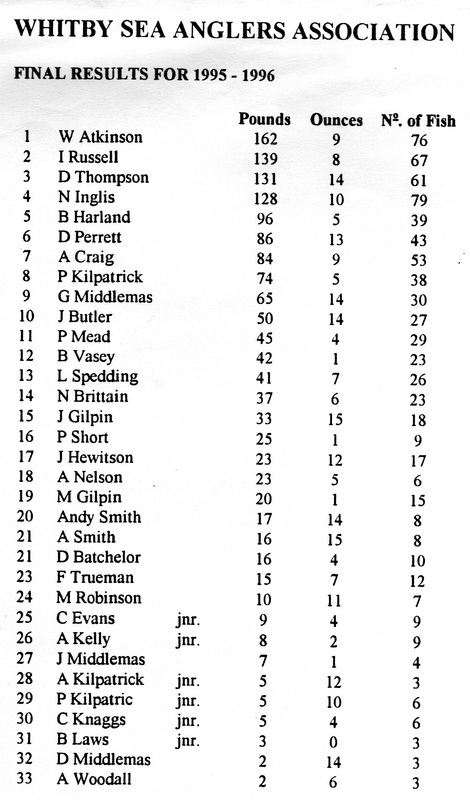 This match incorporated the Doubles Knockout semi-finals in which Paul Kilpatrick and Jimmy Middlemas fished against William Atkinson and Mike Bollands in the final. ​Whitby Sea Anglers ventured to Scarborough to compete in the Annual Inter-Club "Bell Trophy" Competition. All recognised Sea Angling Societies may compete for this Trophy and takes place from the shore, from Coble landing, (Filey) to Argyle Gull (Hayburn Wyke) by invitation only. The mid-week match was a high water ebb event with a big tide, heavy seas and a bitterly cold easterly wind. Club members returned to the weigh in station saying it was difficult to find a “mark” that would fish. Too much wind and white water. 1st - Denis Thompson - 10 lb 07 oz - 2 fish, including one of 8 lb 12 oz. 2nd - Dave Perrett - 4 lb 10 oz - 2 fish. Snow blizzards on Friday and Saturday almost cancelled Sunday’s match, road were clear by Sunday morning due to gritting and a thaw Saturday evening. The cold easterly winds continued and with it the fish scarce, although 7 members did weigh in 10 fish. 1st - Denis Thompson - 7 lb 06 oz - 1 fish (reported this was his only bite). 2nd - Neil Inglis - 4 lb 04 oz - 2 fish. 3rd - Ian Russell - 3 lb 11 oz - 2 fish. 5th - Andy Smith - 1 lb 15 oz - 1 fish. 6th - William Atkinson - 1 lb 10 oz - 2 fish. 7th - George Middlemas - 1 lb 08 oz - 1 fish. The easterly cold conditions remain unchanged and with it the scars and beaches are quiet with very few fish showing along the east coast. Although it was nice to hear a 21 lb 14 oz cod was landed from the Marine Drive at Scarborough by Cloughton angler Mick Chadwick on Sunday night 28th January. This is time of year for big cod which come close to shore to spawn, but unless conditions change to a north westerly blow these specimens will be rare. 1st - John Butler - 4 lb 01 oz - 2 fish. 2nd - Norman Brittain - 4 lb 00 oz - 1 fish. 3rd - Neil Inglis - 3 lb 03 oz - 1 fish. 4th - Andrew Craig - 1 lb 04 oz - 1 fish. 5th - Phil Mead - 1 lb 12 oz - 1 fish. 6th - Ian Russell - 1 lb 07 oz - 1 fish. With a big tide ebbing, anglers were able to reach the low water marks as the clear moonlit night revealed the scars. Again small codling were on the scales as Ian Russell won the match. 1st - Ian Russell - 5 lb 04 oz - 3 fish. 2nd - Andrew Craig - 3 lb 11 oz - 2 fish. 3rd - Jimmy Middlemas - 3 lb 04 oz - 2 fish. 4th - Neil Inglis - 2 lb 13 oz - 2 fish. 5th - Denis Thompson - 2 lb 01 oz - 1 fish. 6th - Bernard Vasey - 1 lb 10 oz - 1 fish. 7th - John Butler - 0 lb 12 oz - 1 fish. Still an easterly swell with plenty of colour in the water and a light chilly breeze produced fish from either side of Whitby. Sandsend and Robin Hoods Bay brought 11 fish to the weigh in station. 1st - Denis Thompson - 8 lb 04 oz - 3 fish. 2nd - Dave Perrett - 5 lb 01 oz - 1 fish. 3rd - William Atkinson - 5 lb 00 oz - 2 fish. 4th - Ian Russell - 4 lb 11 oz - 2 fish. 5th - George Middlemas - 2 lb 02 oz - 1 fish. 6th - Phil Mead - 2 lb 00 oz - 1 fish. The conditions were quite good for a Sunday match, a dry night and a flooding tide with long distance south easterly swell running. But the fish were not taking the large baits of lugworm and mussel that were on offer. 1st - William Atkinson - 8 lb 01 oz - 3 fish. 2nd - Ian Russell - 4 lb 13 oz - 1 fish. 3rd - Phil Mead - 2 lb 01 oz - 1 fish. 4th - Neil Inglis - 1 lb 04 oz - 1 fish. 5th - Paul Kilpatrick - 0 lb 15 oz - 1 flattie. At present 4 members are over the 100 lb weight for the season which concludes at the end of March. William Atkinson - 142 lb 09 oz. Ian Russell - 125 lb 10 oz. Neil Inglis - 123 lb 11 oz. Denis Thompson - 115 lb 01 oz. With conditions at last changing to north westerly reports of anglers fishing the west pier on Tuesday night returned home with fish which had moved in close to feed on the food that had been churned up in the sea swell. By Wednesday the swell had fallen away a little but conditions were still good with a medium flooding tide of 4.8 metres, catches were up on previous club night results. 21 members turned out with 13 weighing in 19 fish for 45 lb 05 oz. 1st - William Atkinson - 10 lb 02 oz - 2 fish, including HF for February so far 7 lb 12 oz. 2nd - Ian Russell - 6 lb 05 oz - 3 fish. 3rd - Andy Smith - 5 lb 08 oz - 1 fish. 4th - George Middlemas - 4 lb 13 oz - 2 fish. 5th - Paul Kilpatrick - 4 lb 11 oz - 2 fish. 6th - Jimmy Hewitson - 4 lb 10 oz - 2 fish. 7th - John Butler - 4 lb 01 oz - 1 fish. 8th - Denis Thompson - 2 lb 07 oz - 1 fish. 9th - Dave Perrett - 2 lb 02 oz - 1 fish. 10th = Andrew Craig - 1 lb 05 oz - 1 fish. 10th = Andy Smith - 1 lb 05 oz - 1 fish. 12th - Bernard Vasey - 1 lb 00 oz - 1 fish. 13th - C Knaggs (jnr) - 0 lb 15 oz - 1 fish. The worst conditions this season arrived for the start of Sunday nights match with strong north north easterly gales and snow blizzards, increasing as the evening drew on. Unable to cast and fish the marks most anglers returned back early. Dave Perrett was the lucky angler, as he was the only one to weigh in with a fish he caught on his first cast. 1st - Dave Perrett - 2 lb 02 oz - 1 fish. 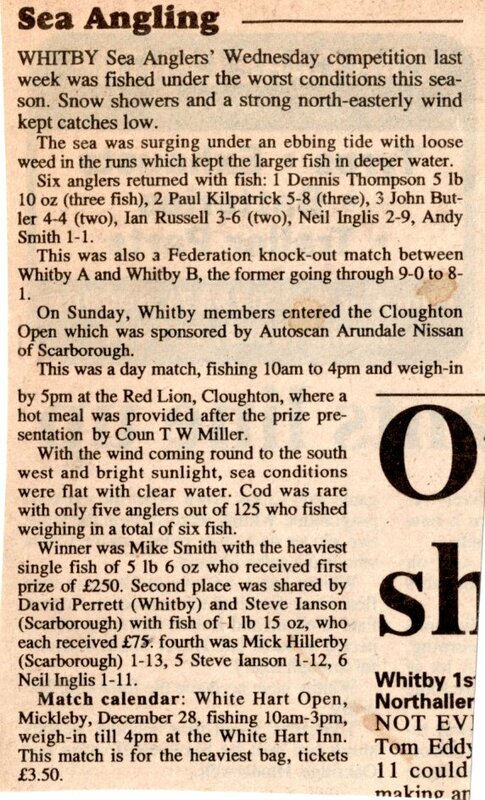 Last Tuesday the Whitby “A” Team of William Atkinson, Denis Thompson, Ian Russell, and Dave Perrett beat Cloughton in the South Regional Final, they now go on into the Federation Final fished later in March / April. Wednesday nights club match produced 10 fish between 4 anglers, with a big 6 metre tide ebbing fast and a slight easterly swell William Atkinson again found the fish. 1st - William Atkinson - 9 lb 14 oz - 3 fish. 2nd - George Middlemas - 9 lb 09 oz - 3 fish. 3rd - Paul Kilpatrick - 5 lb 14 oz - 3 fish. 4th - Denis Thompson - 3 lb 03 oz - 1 fish. The sea had become calm for Sunday nights event, starting to fish 2 hours before high tide, there was still plenty of colour in the water, but very few bites. For the second match this season only one angler returned with fish to weigh in, Bernard Vasey landed a 1 lb 10 oz fish from ”The Top of The World” Sandsend Cliffs, with a cocktail of peeler and mussel. There was another poor result to the midweek match as the conditions were quite good with a northerly long distant swell running in. Whitby Sea Anglers were expecting to hook into fish from the slow flooding tide which started one hour before the match started, but the swell were a little too heavy at times, and only 4 fish were brought to the scales. 1st - Dave Perrett - 3 lb 01 oz - 1 fish. 2nd - John Butler - 2 lb 07 oz - 1 fish. 3rd - Bernard Vasey - 2 lb 01 oz - 1 fish. 4th - Denis Thompson - 1 lb 08 oz - 1 fish. William Atkinson won the sweep for the heaviest fish of the month competition for February having a fish of 7 lb 12 oz on the 14th February. With his first weigh in for 15 matches Brian Harland won Sundays match with 5 fish for 12 lb 07 oz. The sea state was fairly good with a north by north westerly light wind giving movement close in to shore on an ebbing tide. 1st - Brian Harland - 12 lb 07 oz - 5 fish. 2nd - Andrew Craig - 7 lb 04 oz - 3 fish, fishing in the same area as Brian. 3rd - George Middlemas - 5 lb 00 oz - 2 fish. 4th - Denis Thompson - 2 lb 06 oz - 1 fish. The mid-week match was yet another single fish weigh in, this time it was Paul Kilpatrick’s turn to be the victor, a codling of 2 lb 07 oz from the beaches near Sandsend. With a big tide 5.6 metres ebbing tide and a south easterly swell the fish remained scarce on the scars. Sunday’s match was a little better, fishing a top of the tide ebb match which produced 5 fish to the scales. 1st - Jimmy Hewitson - 3 lb 14 oz - 2 fish. 2nd - Andrew Kilpatrick (Jnr) - 3 lb 10 oz - 1 fish from the west pier. 3rd - Denis Thompson - 2 lb 08 oz - 1 fish. 4th - Paul Kilpatrick (Jnr) - 0 lb 14 oz - 1 flattie, also from the west pier. There were 3 anglers reporting of “the one that got away”, better luck next time lads. The easterlys still continue to dominate along the east coast and with it the old saying of “when the winds are in the east the fish bite the least” has proved to be this season. The north westerlys have been rare and the fish have not moved south in their normal winter cod run. The mid-week match was spoiled by a strong north easterly cold wind and again some marks were not fishable. For the first time this season the scales were not “hung out” as no fish were landed despite 12 members fishing. The sea swell was rough with no wind for the match, fishing an ebbing tide Brian Harland had a hard task when he hooked into the best fish in the club this season. He was fishing in rocky ground when the 12 lb 10 oz cod took the cocktail of lugworm and mussel. In his last cast he landed another codling, weighing in a total of 15 lb 08 oz. 1st - Brian Harland - 15 lb 08 oz - 2 fish. 2nd - Neil Inglis - 3 lb 11 oz - 1 fish. 3rd - Paul Kilpatrick - 2 lb 00 oz - 1 fish. Wednesday 20th March & Sunday 24th March 1996. With the season almost at an end, the remaining club members who fish to the end will be glad when the last match is fished. 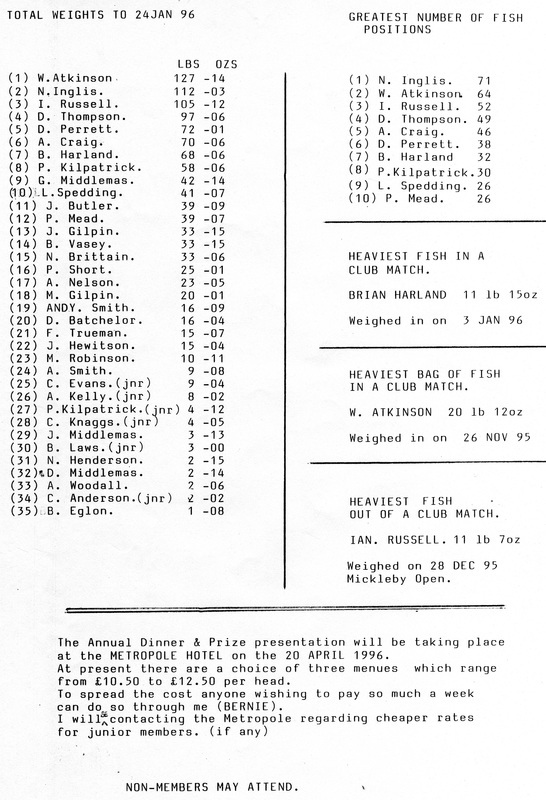 There were only 2 codling in 2 matches weighed in. Denis Thompson triumphed in both, with a fish of 2 lb 03 oz on Wednesday, fishing on a flat calm night from an ebbing tide and a 2 lb 10 oz fish on Sunday. Conditions were slightly better with a light south easterly stirring a little colour to the water. Small fish bites were keeping the junior members active on the west pier extensions as undersized flat fish were returned to the water. 1st - Neil Inglis - 1 lb 04 oz - 1 fish. 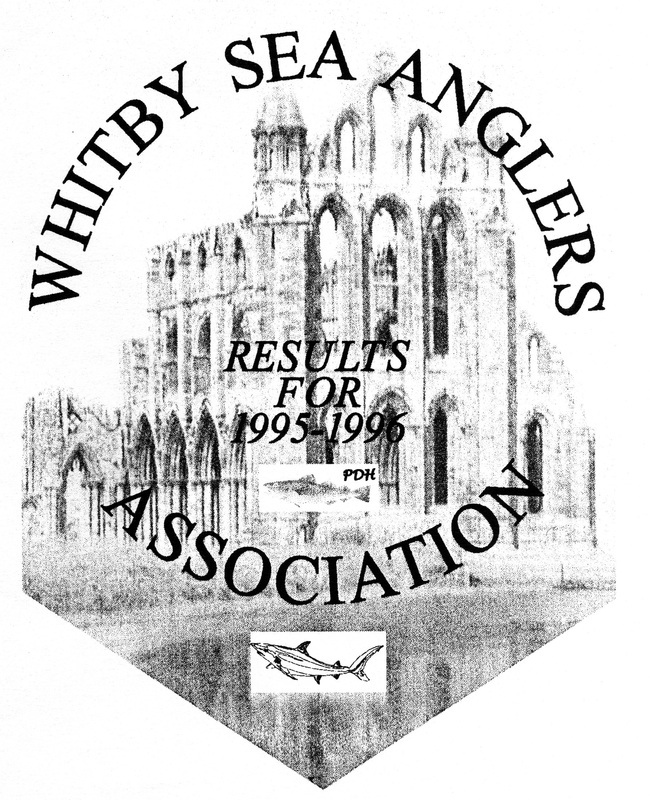 Whitby Sea Anglers can now stow their gear as the 1995 - 1996 season came to an end. The last match was fished on a dry cool night and a calming northerly swell with the tide ebbing allowing anglers to reach the tangles and low water marks. Ian Russell produced the only fish to be weighed in, 3 codling for 7 lb 09 oz, winning the match and also putting him back in second place overall for the season. 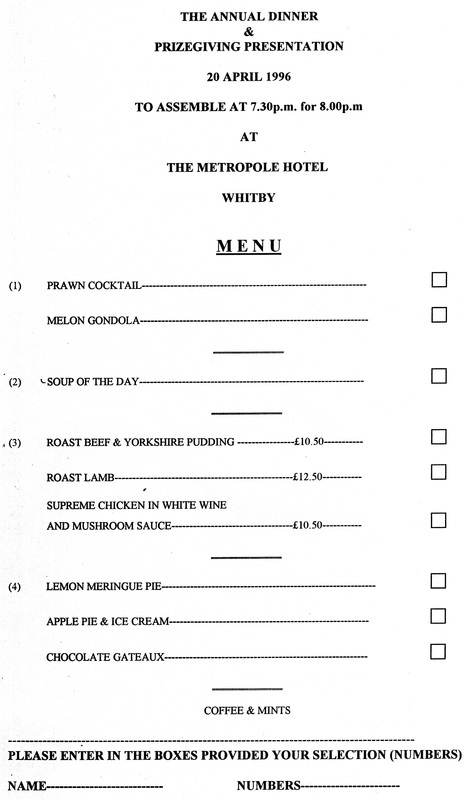 The club will be holding their annual dinner and prize giving presentation at the Metropole Hotel on 20th April 1996. Completed 3rd February 2013 PDH.